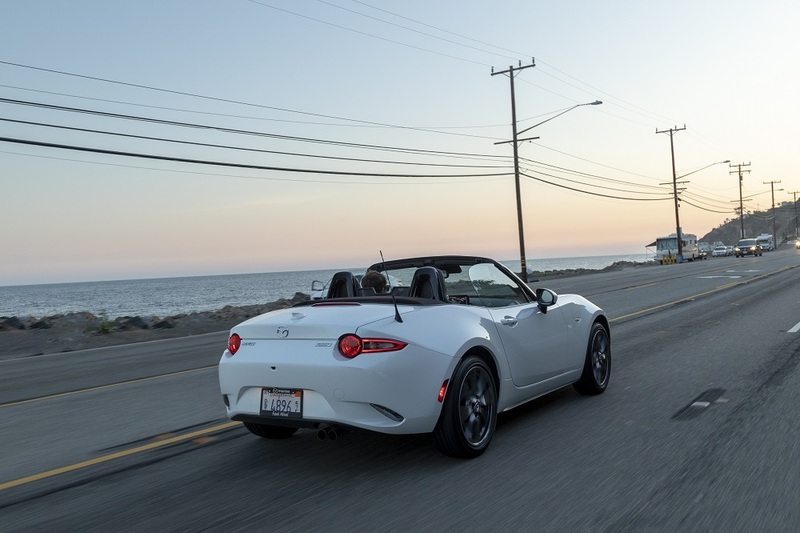 Mazda says there is nothing more satisfying than owning and driving a roadster. We add that it might not be your long-term lifestyle drive, but every driver should own one just once and experience the exhilaration of open-top road driving. 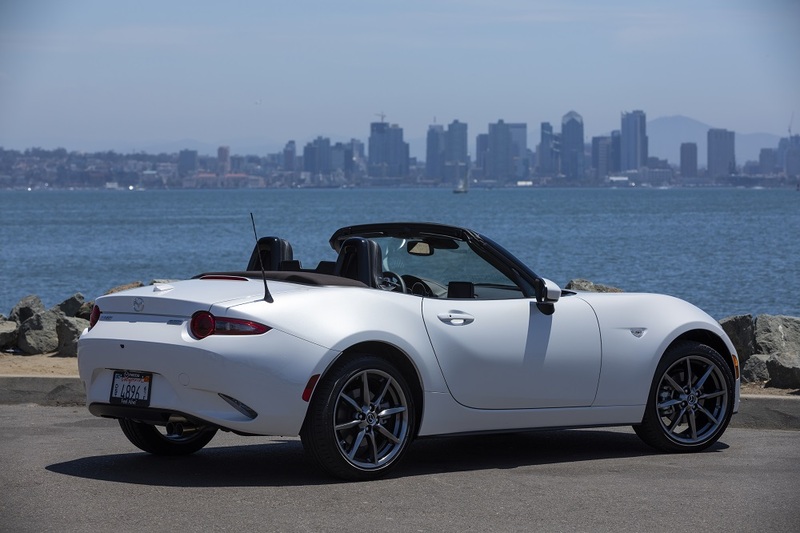 For several years, we have recommended Mazda Miata, which after 30 years, continues to be the popular priced roadster of choice for American drivers. Already really quick, and very fun to drive, Mazda has made it even better for 2019 with a reengineered powertrain, updated technology, styling tweaks and more features for today’s driver. We reaffirm our recommendation of the Miata roadster based on a recent test drive of a 2019 Mazda Miata MX-5 Grand Touring MT (manual transmission) for a week around Central Texas. Out test Miata came in their rich Snowflake White Pearl Mica with Black leather interior and a MSRP of $30,780. 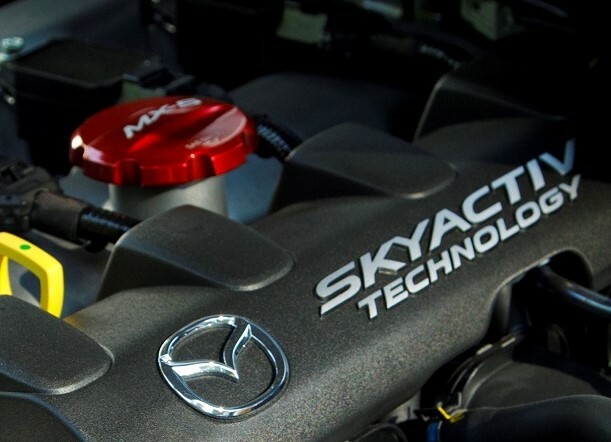 The more powerful SKYACTIV-G 2.0L DOHC engine now produces 181 horsepower at 7,000 rpm with 152 lb.-ft. of torque at 4,000 rpm. Already pretty quick, the additional horsepower is seriously notable when accelerating. Mazda is so proud of that engine, and they should be, it features a distinctive Red Engine Oil Filter Cap with MX-5 Logo. 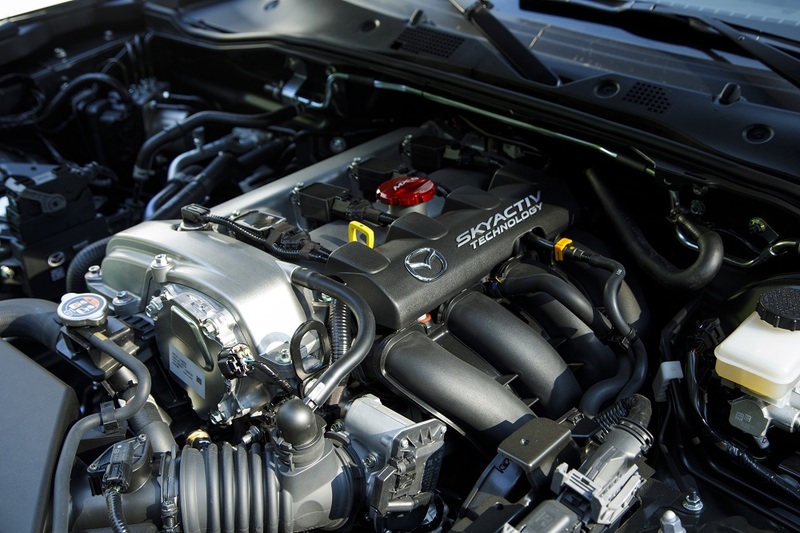 The engine is mated to their highly regarded SKYACTIV-MT 6-speed manual transmission. 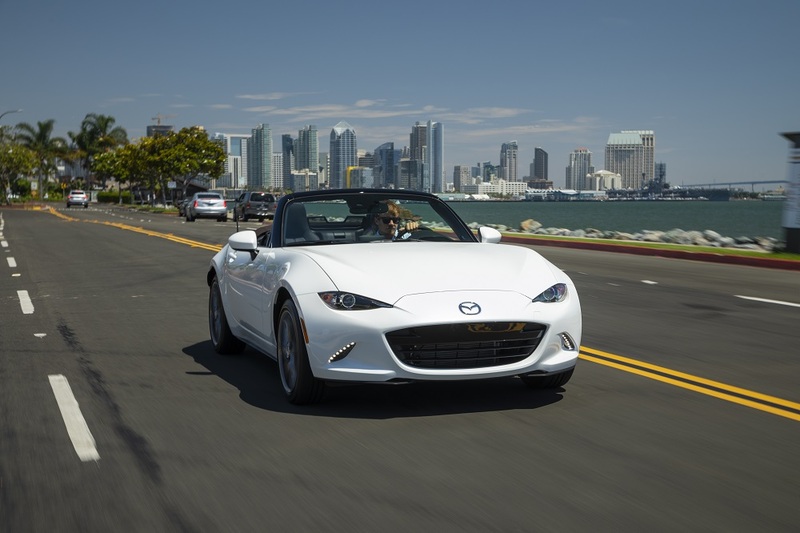 Gearing has been adjusted for the additional horsepower and – with the short handle/short throw shifter, the Miata MX-5 flies through gears with minimum effort by the driver. The Miata MX-5 Grand Touring runs on 17-inch Dark silver wheels mounted with P205/45R17 Bridgestone High Performance Summer Tires. Underneath it features a sport-tuned – double wishbone front and multi-link rear – suspension with Bilstein Shock Absorbers, Front Shock Tower Brace, front and rear stabilizer bars, Torque-Sensing Limited-slip Rear Differential and Double-Pinion Electric Power Assisted Steering. Stopping is solid with ABS 4-wheel/4channel braking with Electronic Brake Force Distribution and Brake Assist equipped with 11-inch discs single-piston caliper vented front and solid rear. And, for effect, Miata MX-5 boasts a unique exhaust note using an Induction Sound Enhancer and Sport-tuned dual exhaust. Fuel economy rating on our test Grand Touring MT was 26/34 mpg city/highway and 29 mpg combined. With a fuel tank capacity just short of 12-gallons, you can expect a highway drive range upwards 375 miles – just right for weekend road trips. 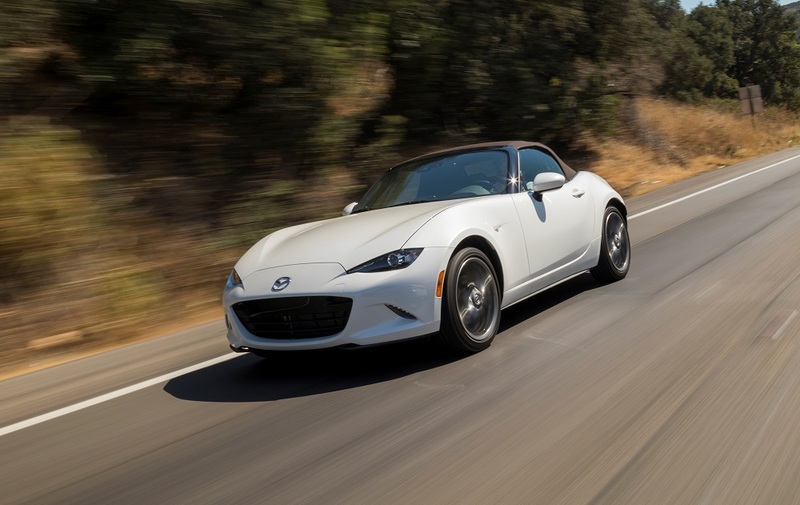 The 2019 Mazda Miata MX-5 is sleekly and compactly styled as befits a premium popular prized roadster. 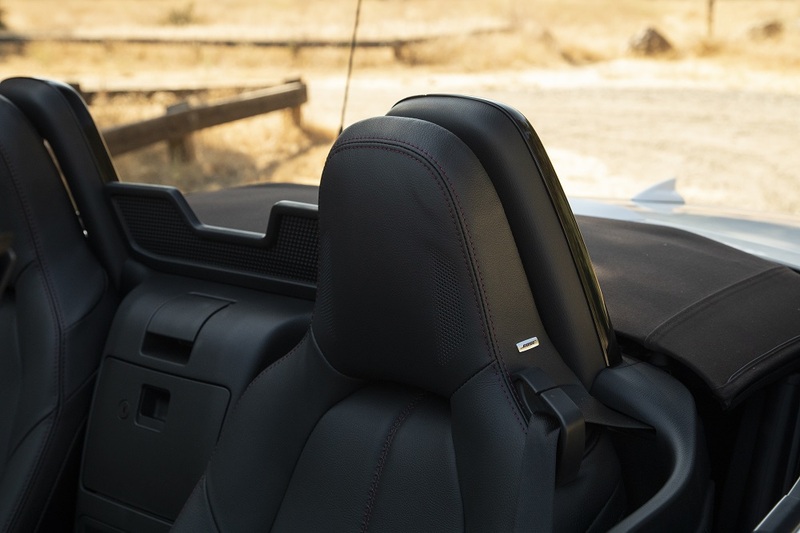 Our Grand Touring featured the new Brown fabric lined manual soft top. Well-fitted it, keeps outside noise to a minimum. The rear window is glass and is equipped with a defroster. The top is fully openable from inside the cockpit and features a mesh aero board to block the wind when down. Other styling elements include Automatic LED Headlights, LED Daytime Running Lights, LED Taillights, Rain-sensing Wipers, Power Heated Side Mirrors, Body color mirrors, door handles, front and rear bumpers and a rear lip spoiler. 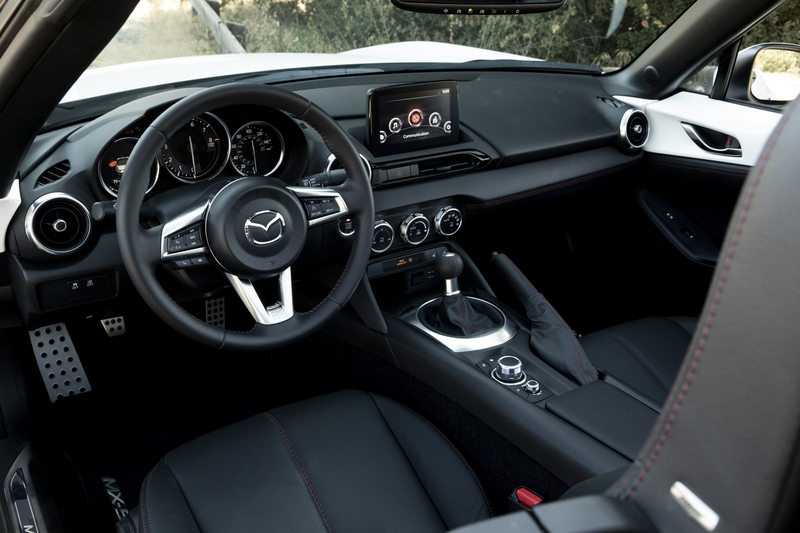 On the inside, Mazda refers to MX-5 interior as ‘snug’ – and it is, but we will get to that in a minute. Seating in our MX-5 Grand Touring was Black contoured Leather Sport Bucket with integrated headrests, bolstering and plenty of support. The seats were heated (three levels), recline and slide forward and back for driver and passenger comfort. A Tilt/Telescoping steering column features a leather wrapped steering wheel with audio/Bluetooth/cruise control, but is also an aide for access and egress. Which brings us to the ‘snug’ comment. The small Mazda MX-5 roadster, by design, has a small cockpit. Accordingly, the cabin is tight to get in to, but actually reasonably comfortable once in. Its low headroom – just 37.4-inches – makes getting in and out a bit tight, but the adjustable steering column plus some ‘learning’ will get the bigger driver (like myself) in and out. 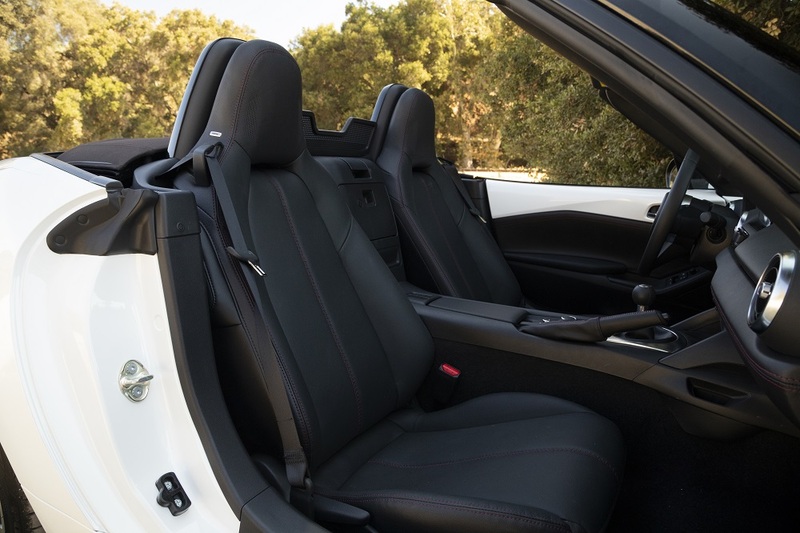 Once in, a very comfortable seat – 52.2-inches of shoulder room, 52.0 inches at the hip and 43.1 inches of leg room – makes operation of the MX-5 a driving pleasure. Other interior features include Automatic Climate Control, Full Instrumentation in black with white lettering for the Tachometer, Speedometer and Multi-Information Center surrounded by bright ring accents. Interior trims are in Black Vinyl Leather with door panel uppers in the body color. Other elements are Piano Black Seat Back Bar Trim, Alloy Pedals, Bright Louvre Vent Bezels, Stainless Door Sill Trim Plates, Dual Cup Holders, Lockable Console Storage and Carpeted Floor Mats. With its very compact trunk, you will be leaving your big hard-side luggage at home when traveling in an MX-5. With under 5-cubic feet of space, weekend trips will require soft-side luggage plus some ‘loose stowing’ to get it all in. 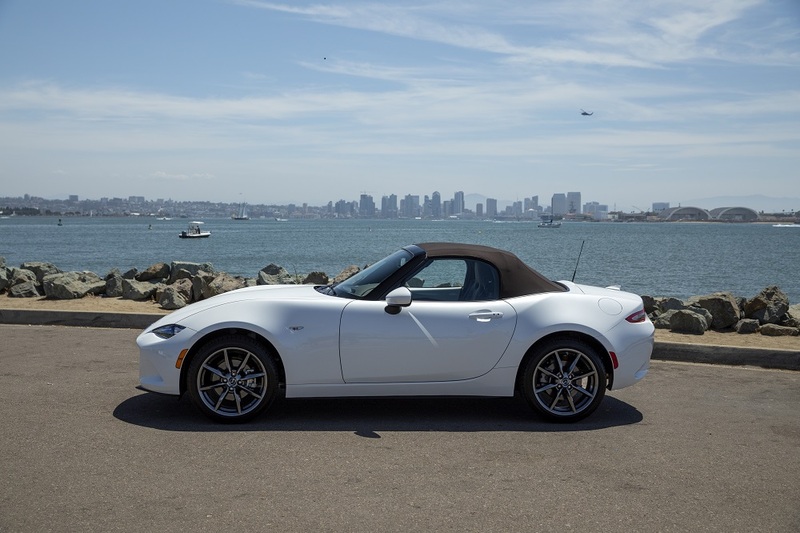 Our MX-5 Grand Touring was equipped with Keyless Entry and Push Button Start along with Mazda Connect. 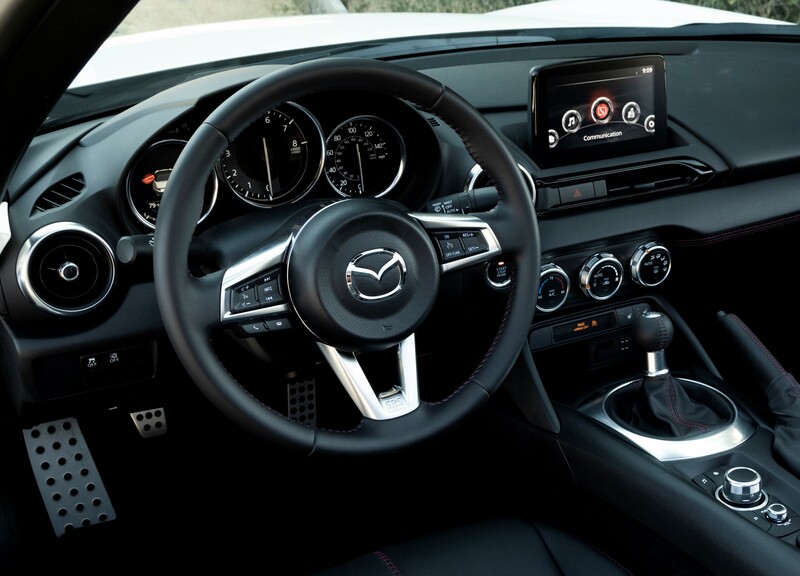 The Mazda Connect system featured a 7-inch color touch screen and Multi-Function Commander Control and included a Bose Premium Audio with 9-speakers (including headrest and subwoofer) and Speed Sensing Audio Control. 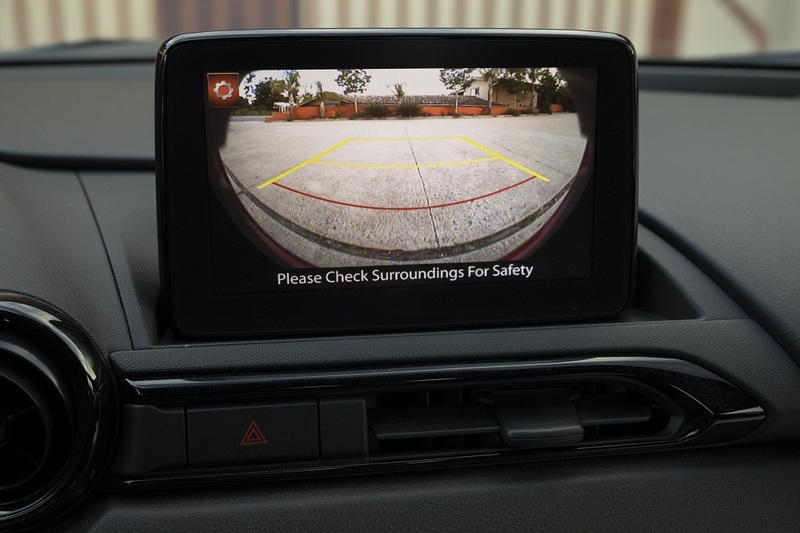 Other elements include Mazda Navigation, SiriusXM Satellite Radio, Bluetooth hands-free phone and audio streaming, HD Radio, auxiliary jack, 2 USB inputs and a 12V power outlet. We noted that the Grand Touring did not include or offer SiriusXM Traffic and Travel Link or Android Auto and Apple CarPlay compatibility. 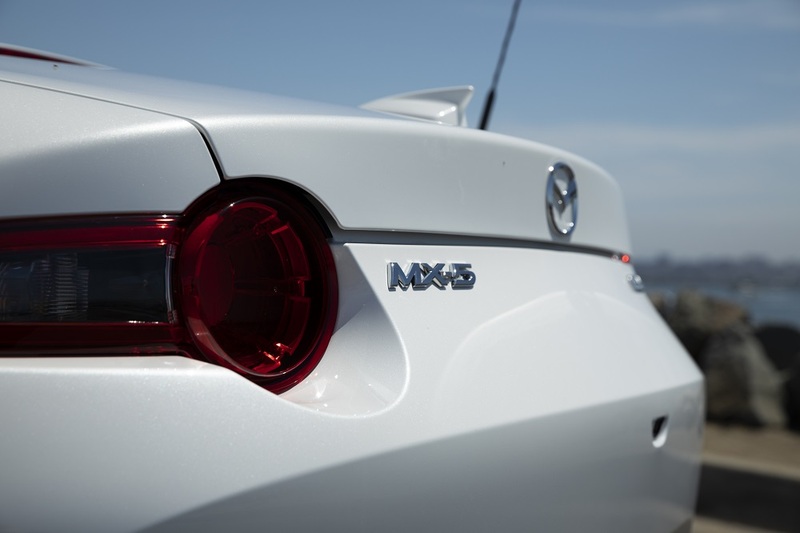 We only mention it, because Mazda did include them in the 2019 MX-5 30th Anniversary Edition. Given the popularity of those features today, the top-tier Grand Touring MX-5 should have them – at least – available. Our test car came with standard Dynamic Stability and Traction Control and featured an assortment of driver assistance safety elements. They included a Rear-View Camera, Blind Spot Monitoring with Rear Cross Traffic Alert, Lane Departure Warning, Smart City Brake Support (low speed emergency braking), Adaptive Front Lighting with High Beam Control, Traffic Sign Recognition and Tire Pressure Monitoring System. We particularly noted the dual front airbags, front side-impact air bags and side-impact door beams as very important given the size of the roadster. As we said, everyone should own a roadster at least once in their lives. The Mazda Miata MX-5 will not disappoint. 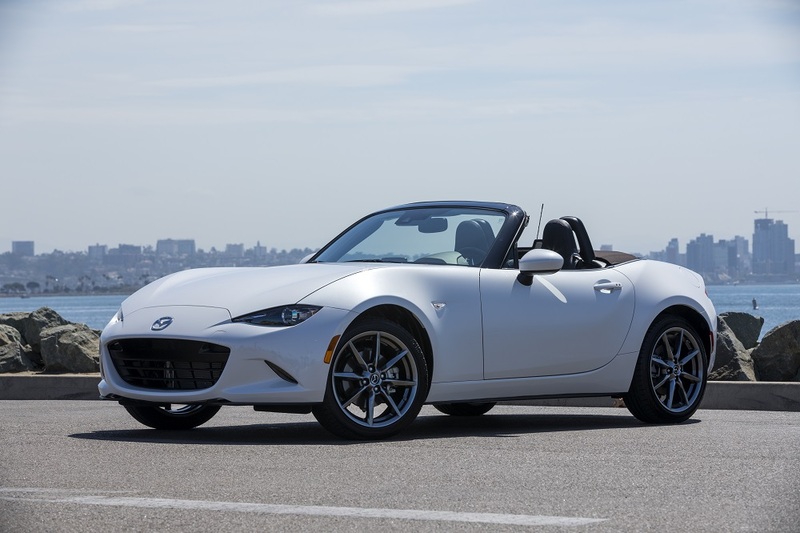 Our 2019 Mazda Miata MX-5 Grand Touring – with some package and feature adds – priced in our driveway at $33,050. We would have ordered ours with the optional Auburn Nappa Leather interior ($300) which we think would more boldly compliment the Snow Blake White color and the new Brown soft top. Three levels of the MX-5 are available in 2019. They come standard with a 6-speed manual transmission and are priced (MSRP) SPORT $25,730, Club $29,590 and Grand Touring $30,780. An optional automatic transmission is offered on all three trims with a retractable fastback top available on the Club and Grand Touring models.